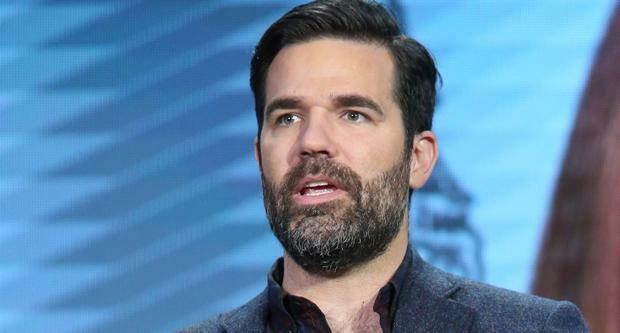 Rob Delaney has been a “bag of wet rubbish” since his son died 14 months ago. The 'Catastrophe' actor's two-year-old son Henry died of cancer in January 2018, and he has now said the tragedy has “been very hard” to deal with, and he’s only just learning how to cope with the “waves” of emotion he feels. Rob, 42, has opened up on his loss several times, and says the reason he wants to speak out is because he wants to let other grieving parents know it’s “okay that they feel terrible”. He added: “The reason I’m being honest with you and not trying to impress you, and make you think I’m cool or that I’m a tough guy, or maybe working through loss in an inspiring way, is that I have found that if a bereaved parent or bereaved sibling reads this, I want them to know that it’s okay that they feel terrible, sad, confused and so brutally humbled. The actor - who had Henry with his wife Leah, with whom he also has two older sons, ages seven and six, and a baby boy born late last year - then praised charity Rainbow Trust for their work in supporting families with ill children, as he says Henry’s care worker was “like a paratrooper”. Speaking to the Evening Standard newspaper whilst at the Rainbow Trust’s annual Trust In Fashion fundraiser, he said: “We were at Great Ormond Street Hospital for seven months, and then we were at our local hospital for seven months, and then we were home with Henry for seven months, and then he died. It would have been towards the end of our Great Ormond Street stay that we would have been hooked up with Rainbow Trust. The care worker assigned to us was a woman named Fiona who was just amazing, and remains so. She still comes and visits us sometimes.